Heat oven to 375°F. In large bowl, beat brown sugar, shortening and eggs with electric mixer on medium speed until blended, or mix with spoon. Stir in remaining ingredients until well blended. On 2 large ungreased cookie sheets, drop dough by 1/4 cupfuls about 3 inches apart. Flatten to about 1/2-inch thickness with bottom of glass dipped in granulated sugar. Bake 8 to 10 minutes or until golden brown around edges. Cool 3 minutes; carefully remove from cookie sheets to cooling racks. 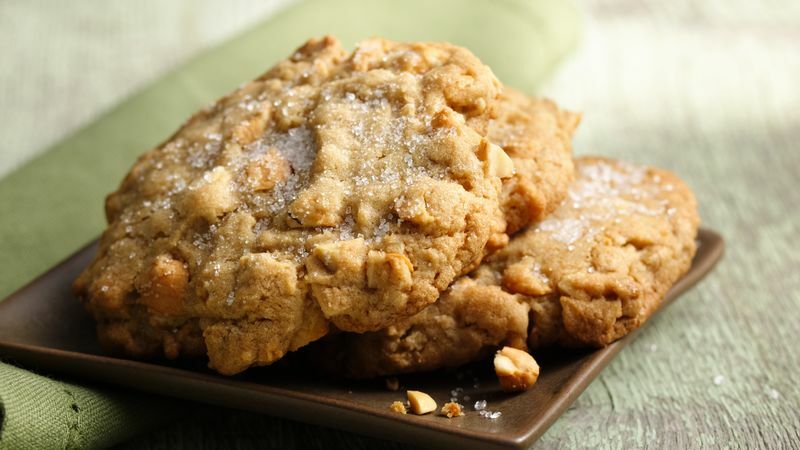 Stir in 1 cup white chocolate chunks or white vanilla baking chips with the cashews.